“Neon Blue-Green Apatite,” 1.99-ct, emerald/radiant cut. © All That Glitters. Used with permission. Although too brittle for most jewelry use, properly cut apatite gems are truly magnificent. A collector could assemble a suite of as many as twenty of these bright gems, all with different colors. Blue Brazilian apatites and those with a “neon” blue-green color, similar to that of Paraíba tourmalines, command the highest prices. Rare, rich purple specimens from Maine are also highly prized. 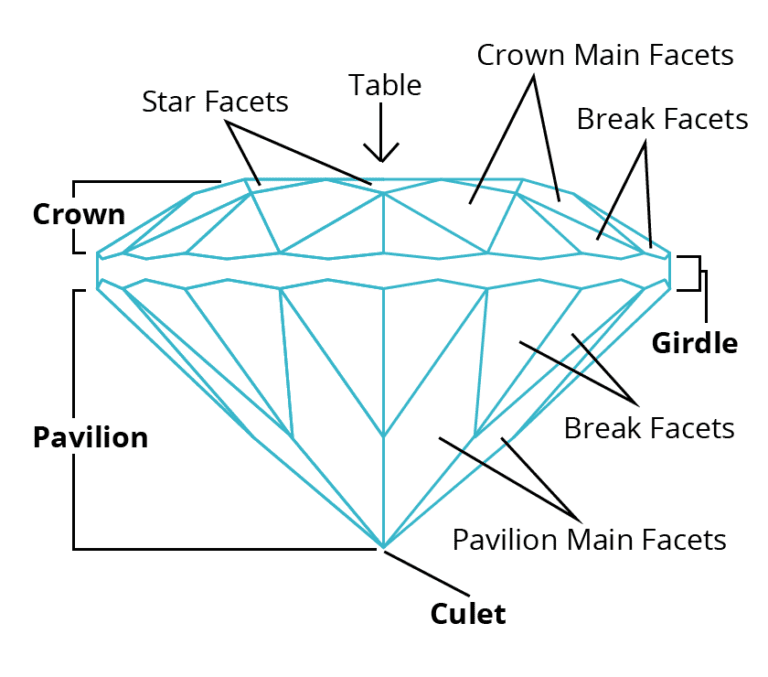 Since apatites are relatively soft stones, skilled faceters can add a premium to their value with exceptional polishes. 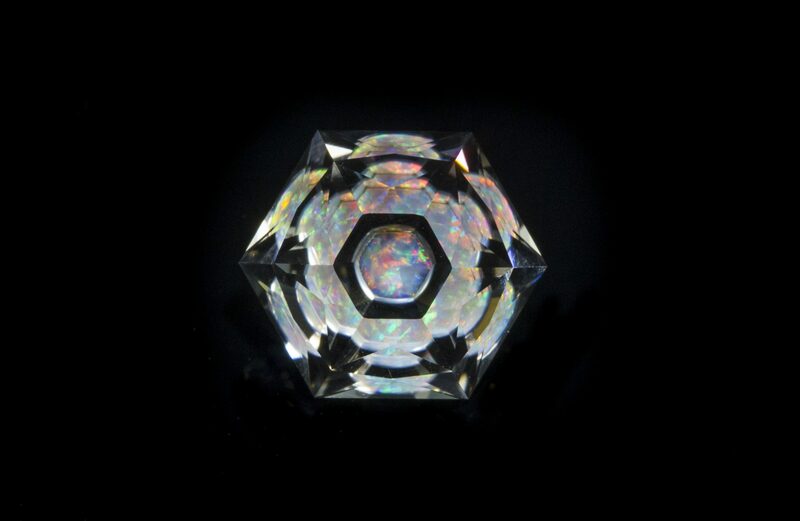 As with most gems, color saturation, size, and clarity are the major determiners of value. Apatite: Myanmar (colorless, 7.34), Mexico (antique, 8.70), Brazil (green,1.09; blue, 0.86)// Madagascar (light blue, 1.07), Brazil-? (green, 12.40; dark green , 2.87), Canada (green, 8.05)// Brazil (dark blue, 0.55), Madagascar (light blue,1.07), Maine (violet,1.02). Photo © Joel E. Arem, PhD, FGA. Used with permission. Colors Colorless, green, white, blue, brown, yellow, purple, violet, gray, pink, and various shades of most of these colors. Crystallography Hexagonal. Crystals usually prismatic or stubby; massive, granular, compact; oolitic, earthy. Refractive Index 1.598-1.667, variable with composition. See "Identifying Characteristics" below. Hardness 5 (some massive varieties 3-4). Specific Gravity 3.10-3.35; massive varieties 2.5-2.9. See "Identifying Characteristics" below. Birefringence 0.001-0.013. See "Identifying Characteristics" below. Absorption Spectrum Blue and yellow apatites display a rare earth (“didymium,” i.e. praseodymium + neodymium) spectrum. Yellow gems have 7-line group at 5800 and 5 lines at 5200. Blue gems give broad bands at 5120, 4910, and 4640. Phenomena Chatoyancy. 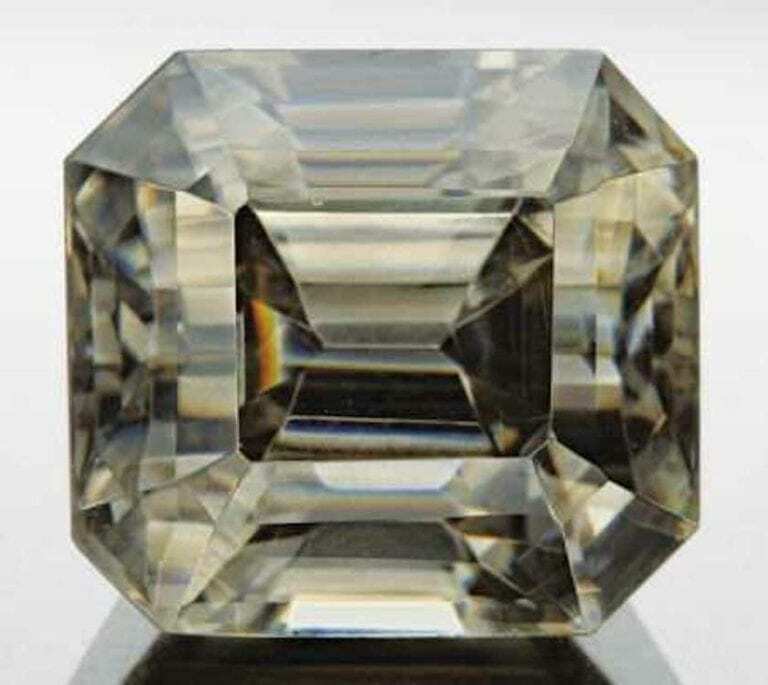 (Synthetics may show color change; natural apatites do not). Ca5(PO4)3(F,OH, Cl)3. Ca often replaced by Sr, Mn. Also contains: Ce, rare earths, U, Th. PO4 replaced by SO4 + SiO2. Carbonate apatites contain CO2. F is also present in the variety francolite. Distinct in blue-green varieties; otherwise weak. Yellow stones may give yellowish/greenish or brownish/greenish. Gem blue apatite shows strong dichroism: blue/yellow. Very variable with composition: e = 1.598-1.666; o = 1.603-1.667. 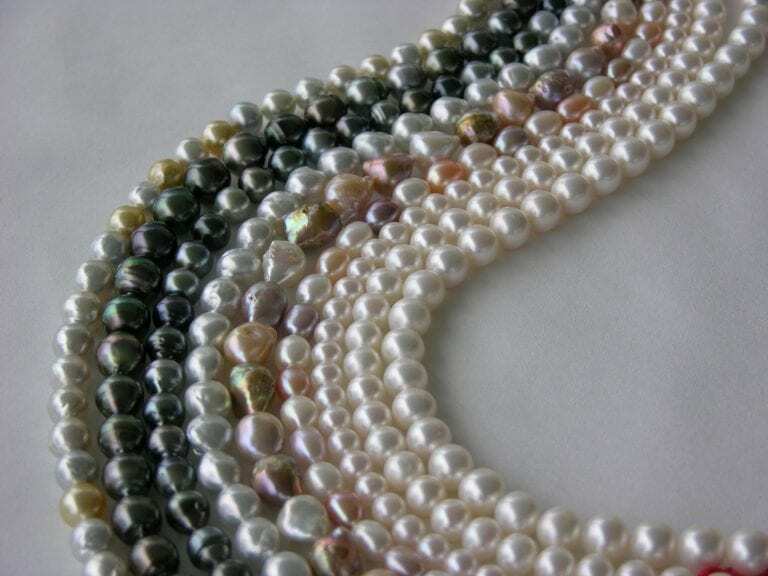 Gem varieties: o = 1.632-1.649, e = 1.628-1.642. See “Identifying Characteristics” below. Uniaxial (-); francolite may be biaxial, 2V = 25-40°. From the Greek apatein, meaning “to deceive,” because mineralogists had confused apatite with other species. Healed fractures, hollow growth tubes. 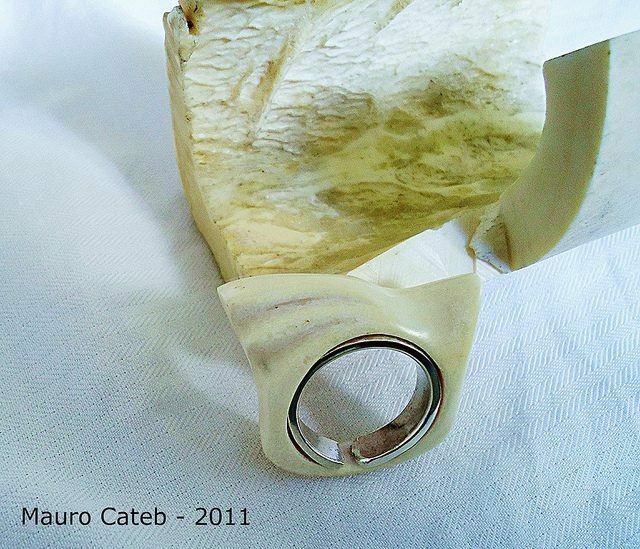 “Bone and Silver Ring,” bone apatite, carbonated hydroxylapatite, by Mauro Cateb. Licensed under CC By 2.0. The apatite mineral group occurs abundantly throughout the world. In fact, bones and teeth consist mainly of a variety known as hydroxylapatite. 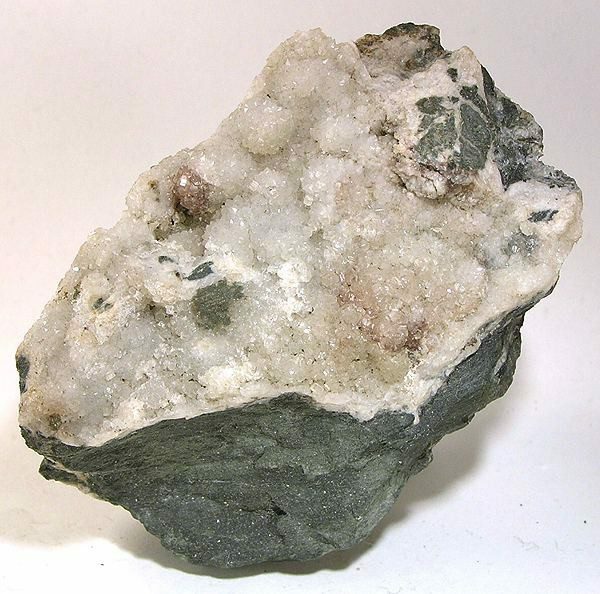 As collophane, a massive cryptocrystalline variety that occurs in some localities as large beds, apatite also serves as the most abundant phosphorus-bearing mineral. Most of the gemstones referred to as apatite are of the commonest variety, fluorapatite. 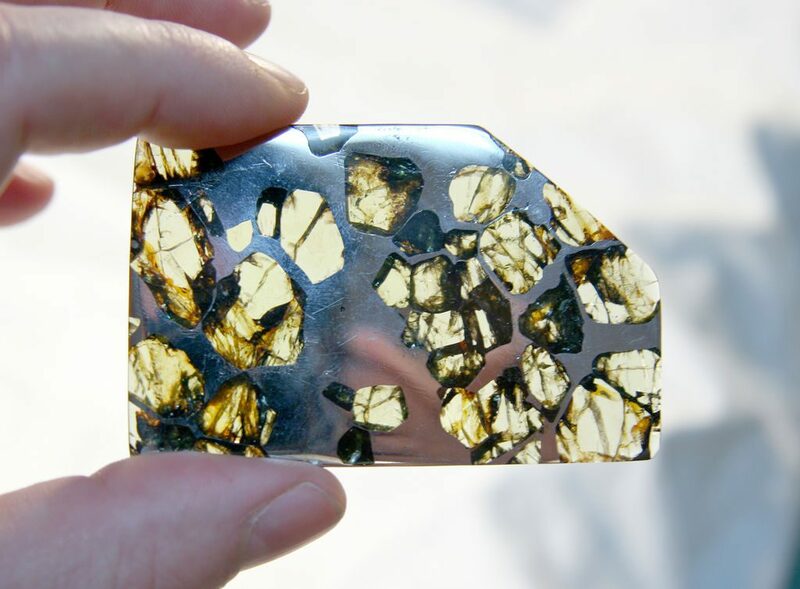 Other gem-quality apatites include the aforementioned hydroxylapatite as well as carbonate-rich apatite, mimetite, moroxite, vanadinite, wilkeite, and the rare chlorapatite. Lazurapatite, a mixture of lapis lazuli and apatite, occurs in Siberia. Speaking strictly mineralogically, the term “apatite” refers to the mineral group only. However, you’ll find many gems commonly described just as apatites, without further classification. Prior to the discovery of the now coveted neon blue-green apatites in Madagascar, these colorful but little-known gemstones seldom found their way into jewelry collections. 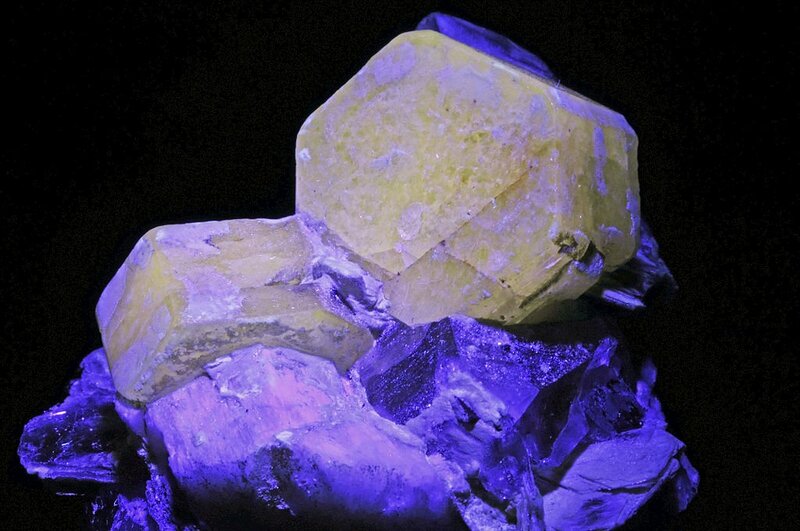 Nevertheless, mineral collectors prized them not only for their colors but also their beautiful fluorescence. 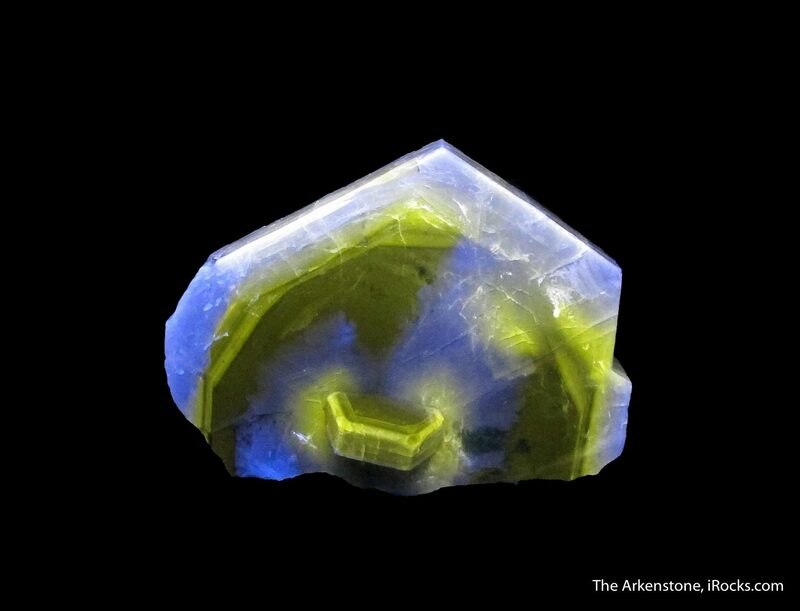 The green and colorless zones of this fluorapatite fluoresce yellow and blue-white, respectively. “Fluorapatite (with Phantoms and Fluorescence),” 5.5 ⨉ 4.1 ⨉ 1.8 cm, Panasqueira Mine, Covilha, Castelo Branco District, Portugal. © Rob Lavinsky, www.iRocks.com. Used with permission. Since the Madagascar finds, the jewelry use of apatites of all colors has increased. Although the color of the best neon-blue green specimens can approximate that of the storied Paraíba tourmalines, all gem-quality apatites have a hardness of 5 at best. 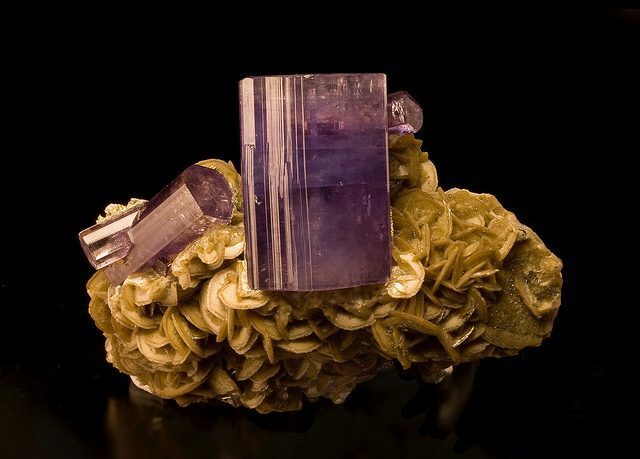 Alas, apatites don’t have the toughness of their tourmaline rivals. They require special care as jewelry stones. 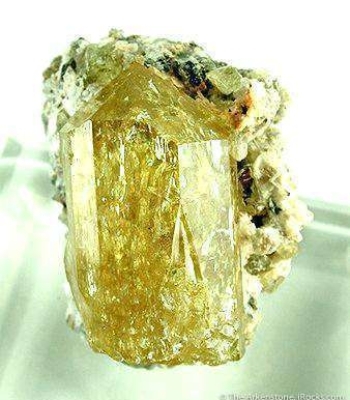 Mexican yellow apatite is perhaps the most abundant gem material available. Thousands of crystals exist that would cut stones up to five carats. This large faceted yellow gem is unusually clean for an apatite.“Apatite (Set),” 5.2 ⨉ 4.4 ⨉ 4.3 cm (Crystal), 1.8 ⨉ 1.8 ⨉ 1.4 cm, 25.5 cts (Gem), Cerro Mercado, Durango, Mexico. © Rob Lavinsky, www.iRocks.com. Used with permission. Chatoyancy can occur in blue-green and green gems from Myanmar and Sri Lanka. Brazil can produce green cat’s eyes. Sri Lanka and Tanzania can produce yellow cat’s eyes. 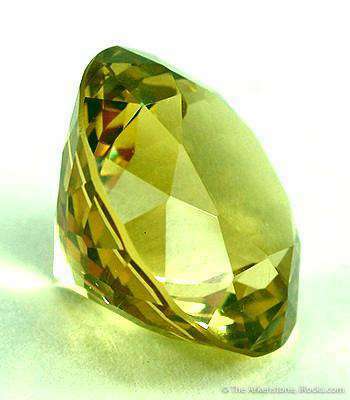 The chatoyancy in Tanzanian apatites can be so intense that the material resembles cat’s eye chrysoberyl. Apatite: Catseye apatite, India (~2.4, 5.6). Photo © Joel E. Arem, PhD, FGA. Used with permission. Aside from a destructive scratch test to determine hardness, distinguishing apatites from tourmalines can sometimes prove challenging. Many of their properties overlap. Read this article on difficult separations for tips on identifying these gems. Chlorapatites have the lowest birefringence (~0.001). Carbonate apatites can range as high as 0.008. (The francolite variety can even reach 0.013). “Carbonate-Rich Apatite-(Caf) (Var: Francolite),” 6.9 ⨉ 6.3 ⨉ 3.5 cm, Fowey Consols (Wheals Treasure; Fortune; Chance; Polharmon; Lanescot), Tywardreath, Par Area, St Austell District, Cornwall, England, UK. © Rob Lavinsky, www.iRocks.com. Used with permission. Yellow apatites fluoresce lilac-pink in shortwave (SW) and longwave (LW) ultraviolet light, (though stronger in LW). Blue apatites fluoresce violet-blue to sky blue. Violet material fluoresces greenish-yellow (LW) or pale mauve (SW). Green apatites fluoresce a greenish mustard color, though stronger in LW than SW.
Manganapatite fluoresces pink in SW. In this variety, manganese (Mn) replaces calcium (Ca). 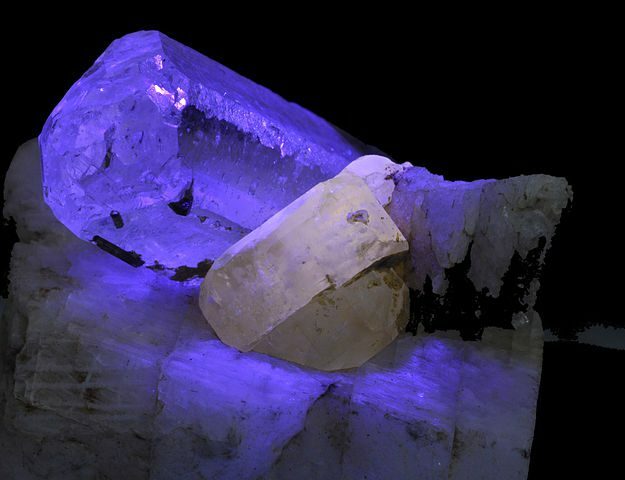 Pink apatite and aquamarine on a matrix of white orthoclase under normal light and under ultraviolet light. Photos by Géry Parent. Public domain. Laboratories have synthesized apatite for medical research, agricultural fertilizer, and industrial laser applications. Some of the stones created for laser research have, in fact, found their way into gem use. The Gemological Institute of America has reported that these synthetics display an unusual color change effect. Natural apatites don’t display color change. Heating can improve color, especially for blue and blue-green stones. Careful heating can turn yellow Mexican material colorless. 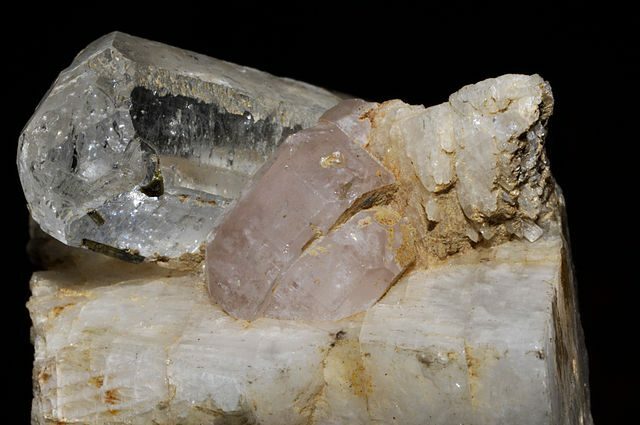 Brazil, Canada, India, Madagascar, and Mexico produce most gem-quality apatites. Blue: Brazil, Myanmar; Sri Lanka. Blue-green: Madagascar (neon blue-green); Arendal, Norway (moroxite variety); Gravelotte, East Transvaal, South Africa. Violet: Germany; Portugal; Maine, California, United States. Yellow: Brazil; Canada; Durango, Mexico; Murcia, Spain. Green: Canada (trade name, Trilliumite); India; Kenya; Madagascar; Mozambique; Myanmar; Portugal; Spain. Cat’s eye: Brazil; India; Myanmar; Sri Lanka; Tanzania. Apatite: Brazil (11.4). Photo © Joel E. Arem, PhD, FGA. Used with permission. Cut apatites are uncommon in museum collections. Blue gems (Brazil) almost always range on the small side (1-2 carats). Myanmar produces 10-carat blue gems. However, this color is very scarce in larger sizes. Yellow gems from Mexico up to 15-20 carats are known, but larger ones are quite rare. The rarest and smallest in general, violet stones usually fall under 2 carats. However, the Roebling purple apatite in the Smithsonian Institution weighs approximately 100 grams (500 carats), a superb crystal. 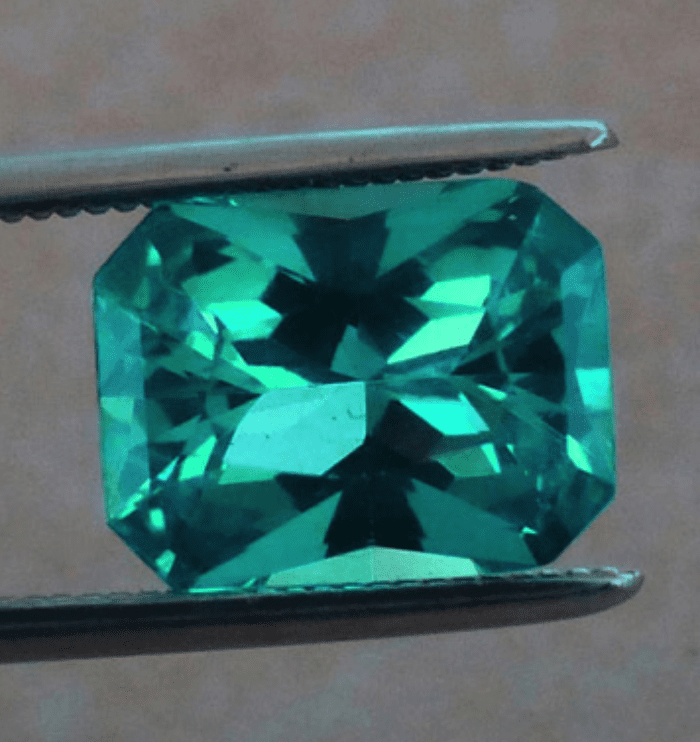 Blue-green clean stones usually weigh less than 5 carats, very rarely more. Green apatite occurs in large crystals. Canadian material has yielded 100-carat flawless stones. 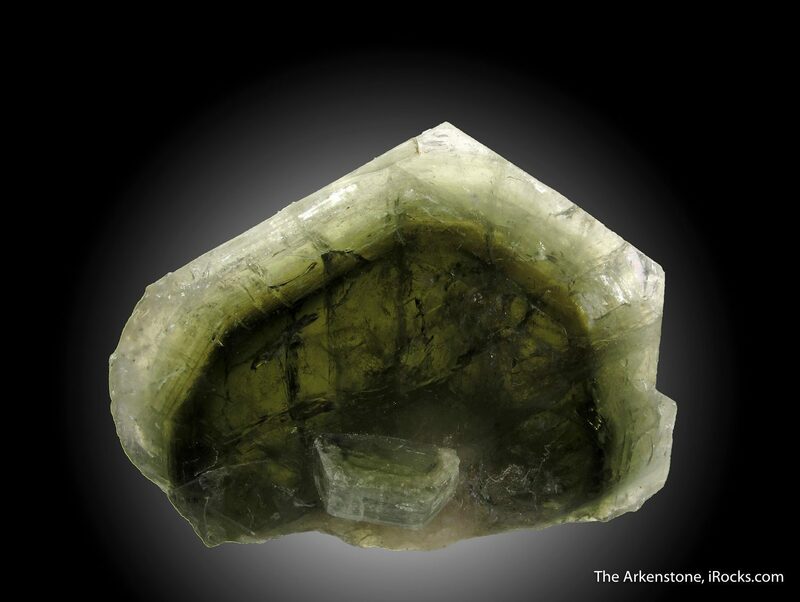 The world’s largest golden green gem may be a 147-carat stone from Kenya. Yellowish cat’s eyes range up to about 15 carats, while green cat’s eyes can weigh a bit larger (20 carats). “Apatite on Siderite,” Panasqueira, Portugal, by Thomas Spann. Licensed under CC By 2.0. Brittle and sensitive, apatites must be cut and worn gently. Although difficult to cut and polish, apatites faceted with gem designs for quartz, tourmaline, and topaz will look wonderful. 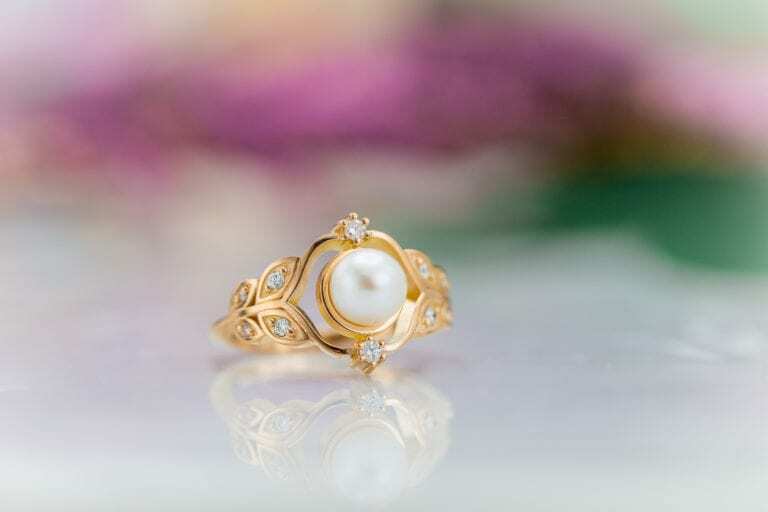 For rings, use protective settings and reserve for occasional wear. 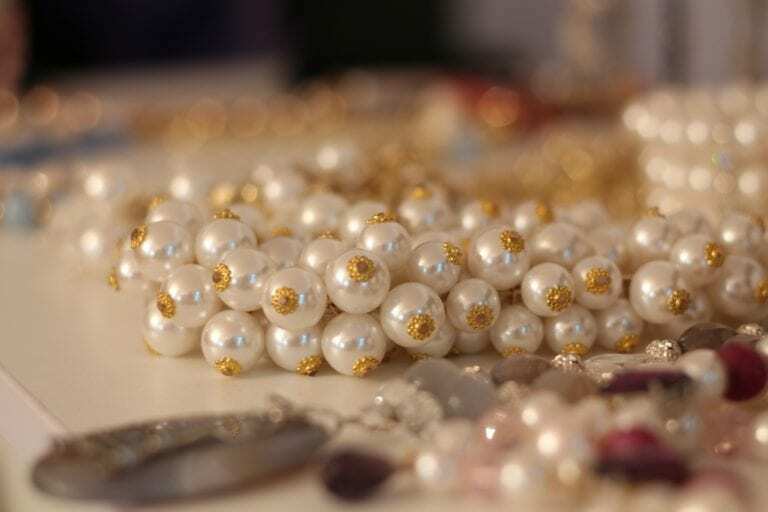 Earrings, pendants, pins, and tie tacks make safer jewelry options. Since apatites are acid, heat, and shock sensitive, they deserve the same storage, care, and cleaning regimen as opals. Never use mechanical cleaning systems on these pieces. For more recommendations, consult our gemstone jewelry care guide. “Hammered copper, carnelian, and blue apatite earrings 3” by knitsteel. Licensed under CC By-SA 2.0.